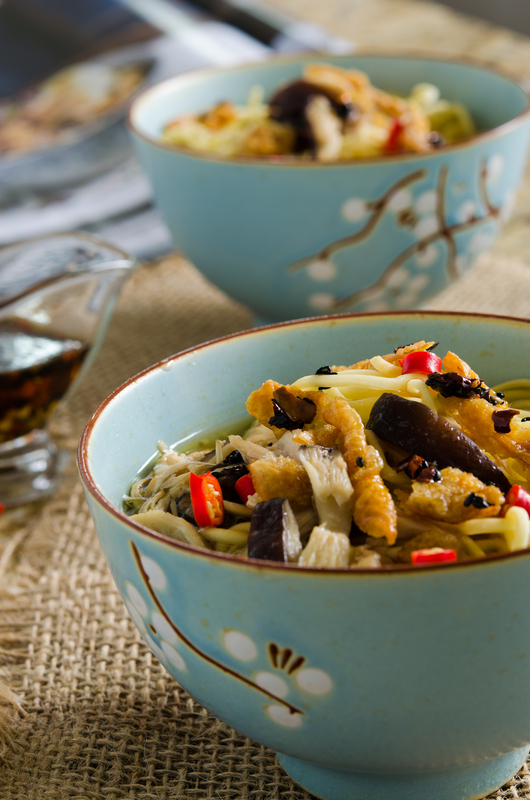 Who doesn’t love a big, hot bowl of chicken soup, right? It is probably the most unifying of dishes, connecting cuisines all around the globe; each country boasting its own unique ingredients and flavours. We all grew up on it, warming our core on a frigid winter’s day or being comforted with a steaming bowl when feeling sick. I never really thought about posting a recipe for chicken noodle soup until I saw this one in Donna Hay magazine, issue 75. The ingredients were unusual enough to intrigue me and inspire me into whipping up a big pot. One spoonful told me that I had to post this and share it with you all. Miso paste and dashi powder (a bold Japanese soup base) make this soup uber complex. 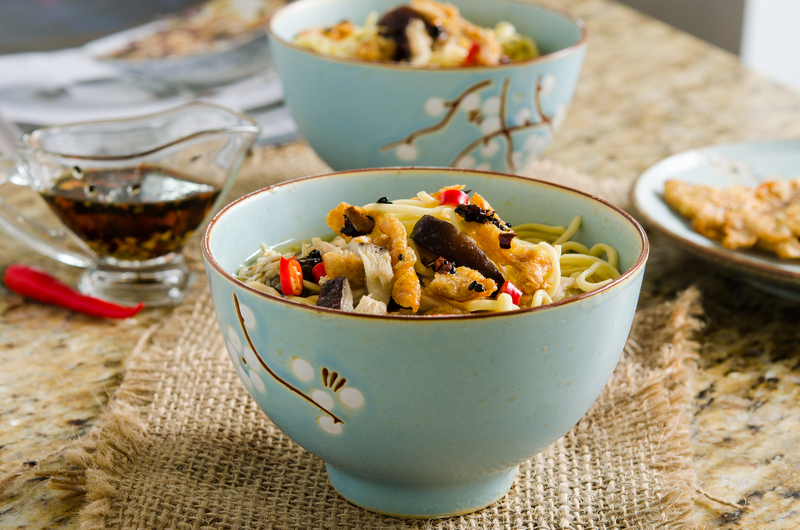 Poured over plump egg noodles and exotic shitake mushrooms, then pumped up with sesame-chile oil, this soup will seduce your taste buds into becoming a favourite in your home! I am bringing a gigantic pot of my soup over to Angie’s Fiesta Friday this week! Get there early because there will be a long queue for this dish! If you haven’t joined us yet, be sure to do so at Angie’s new digs FiestaFriday.net . The flavours here are unusual and enticing. Using kitchen or poultry scissors, cut the chicken in half. Carefully remove the skin and set aside. Heat the oil in a large saucepan over high heat. Add the chicken wings, leeks, garlic and ginger, and cook, stirring for 5 minutes, or until golden. Add the halved chicken, water, soy sauce, dashi, miso paste and the dried mushrooms and bring to a boil over high heat. Reduce the heat to medium and simmer for 11/2 hours. Strain, reserving the stock and the chicken halves, and extra meat that has fallen off the wings. While the soup is cooking, place the chicken skin in a large, non-stick frying pan over medium heat. Cook for 6 minutes on each side or until crisp and golden. Drain on paper towels and sprinkle with salt. Wipe out the pan and return to medium heat. To make the chile sesame oil, add the vegetable oil and sesame seeds to the pan and cook for 2 – 3 minutes, stirring until golden. Remove from the heat and add the chiles, sesame oil and salt. Set aside. Shred the chicken, discarding the bones. Return the stock to a clean saucepan over high heat and bring to a boil. Add the fresh mushrooms and cook for 5 minutes. 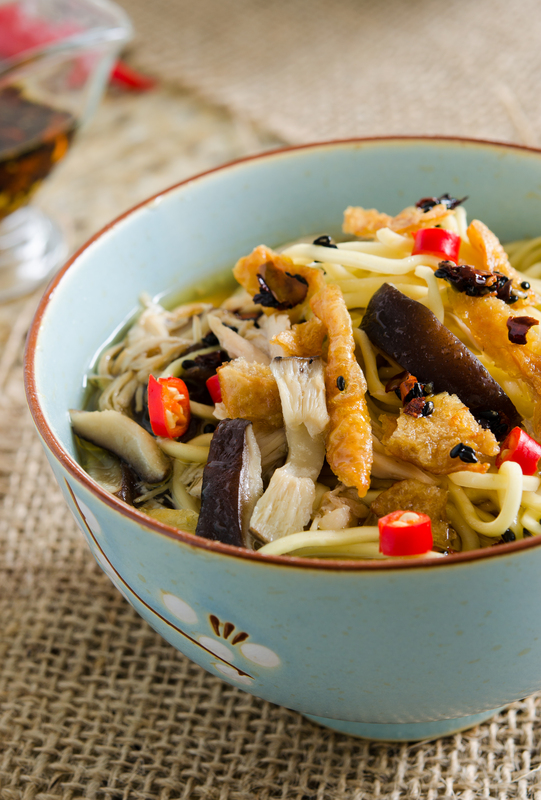 Add the chicken and noodles and cook for 4 – 6 minutes, or until the noodles are tender. Divide the noodles between the bowls. Add the soup to the bowls and top with the crispy chicken skin. Drizzle with the chile sesame oil. *Dashi powder is a highly flavourful soup stock base used in Japanese cooking. It is really worth the time it may take you to find this ingredient, as it has a very distinctive flavour. Top with extra sesame-chili oil for a bit of kick! 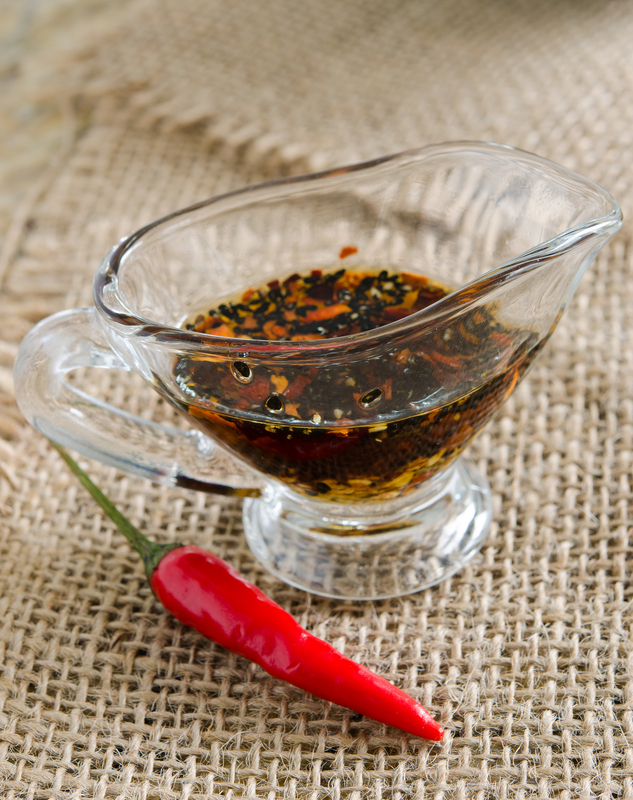 Make your own sesame-chili oil with white or black sesame seeds. Enticing is a perfect adjective to describe the soup. love the bowls and jute linens. Gorgeous! Sounds delicious. And that chili oil I can use with most of my noodle soups, of which I have been making many lately. Just a few of my favorite things! Can’t wait to make this. We all love these kind of soups! Of course we do…. you can always trust Donna Hay recipes, but, you made a great job with this soup, it looks super yummy! This looks fantastic! Even though it is usually quite warm in Hawaii, on the cooler nights, I love a big bowl of soup. Definitely adding this to the list! I love drinking Miso any time, any day!! This looks so comforting and satisfying! I LOVE the pictures too, I’d love a nice big bowl right now, it’s rainy over here and it’d be perfect! I might just have to make myself a batch! Thanks for the information on dashi powder and other necessary ingredients for a miso soup. I’m already thinking of a veggie version!